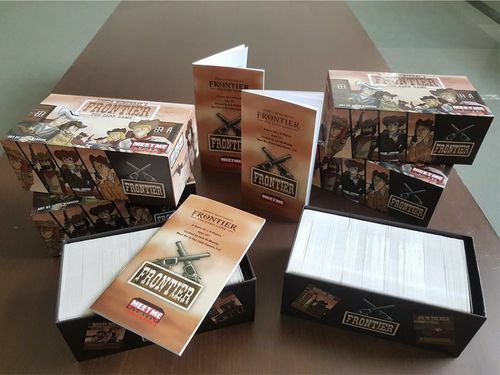 Welcome to the old west, Frontier the Card Game! This game is a multi-player solitaire adventure set in the old west in the style of Oregon Trail or Chainsaw Warrior. 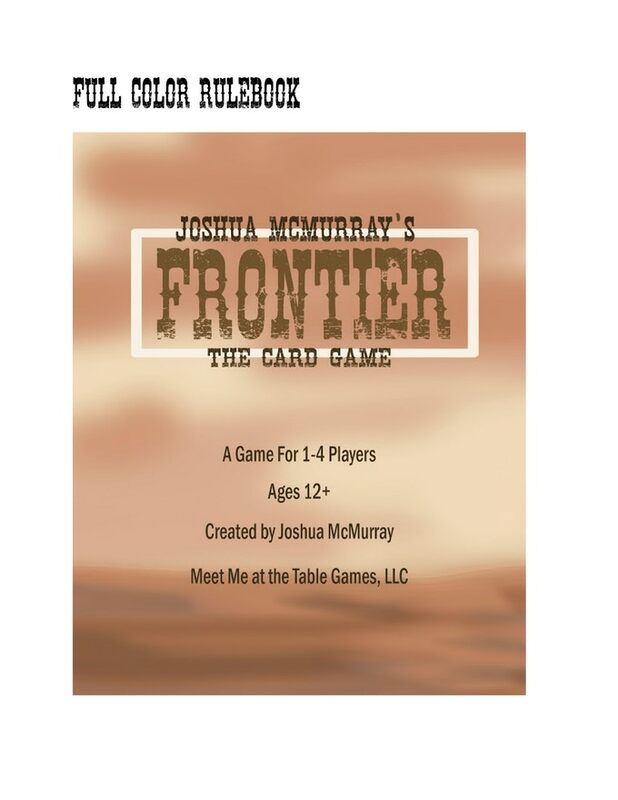 In what appears to be Joshua’s first game design, this labor of love contains components that are fine with glossy, sturdy card stock illustrated with cute, hand drawn western themed art. The box contains 486 cards and rules. I found tracking bounty and stamina throughout the game easier to manage with poker chips than the recommended paper and pencil, which were not included in the box. The rules are very straight forward and easy to understand. A card for each player outlining the capacity limits of all of the supplies would have been helpful when learning; after a play, however, those limits are pretty clear and easily remembered. The goal is to amass the most bounty after nine duels with various gunslingers are resolved. So, how does this adventure play out? First, you gather your gear. 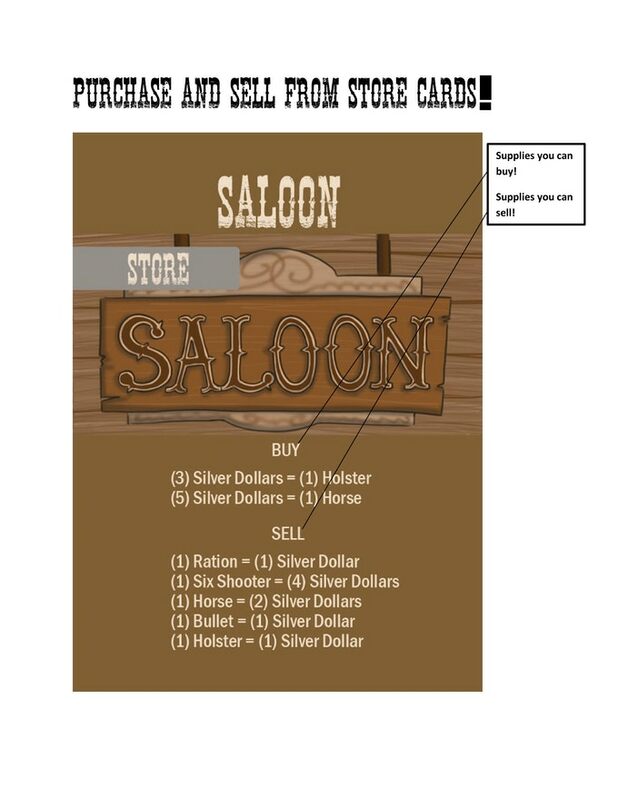 No cowboy would be caught dead without their six shooter, some ammo, rations, horses, etc. The rules outline recommended starting resources based on the levels of difficulty you are willing to sustain. These resources are expended as you live your life in the old west and encounter the many challenges you are soon to face. Once all the cowboys and cowgirls are fitted out, the game begins. Calamities – these are bad things that will befall you on the western trail. Calamities come in two styles. Some have a horse symbol on the card that will allow you to use a horse (discard a horse) to outrun the calamity. Other calamities you just must suffer through. These cards stay with you until you meet the pain required by the calamity. Critter – there are all kinds of strange animals and vermin on the trail. These critters require you to use resources to deal with them, but if successful, they can provide resources and even potential notoriety and bounty points (victory points). Range – these are the activities you discover throughout the great outdoors. Here you can rob trains, discover lucky barrels, mine for gold, find some food, etc. 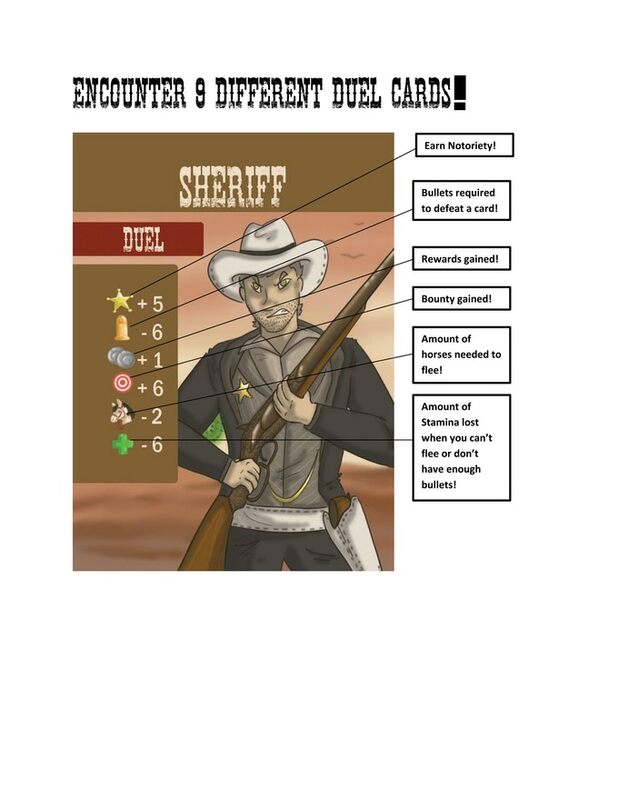 Duel – There are nine legendary gun fighters in the deck and their demise will cause the end of the game. The game presents a daunting stack of 173 event cards. This represents the potential for 173 turns if the final gunslinger duel is the last card of the deck. This many cards can be pretty unpleasant when you must shuffle a card back into the deck, as is called for many times. Thankfully, the turns are rather quick; draw a card, pay a bullet, collect some rations, etc. Over time, you will gain more notoriety from your escapades which will allow you to upgrade your character to draw more cards per turn and purchase things cheaper. Thus, less turns spent but the same number of cards drawn. Since it is a random adventure game, there is little you can do to manage your life and plan ahead and each player’s experience can vary greatly. However, you must manage the depleting resources. There are decisions on buying and selling every turn to manage your resources for emergencies and encounters. You need a holster to hold your six shooter, which holds six bullets. 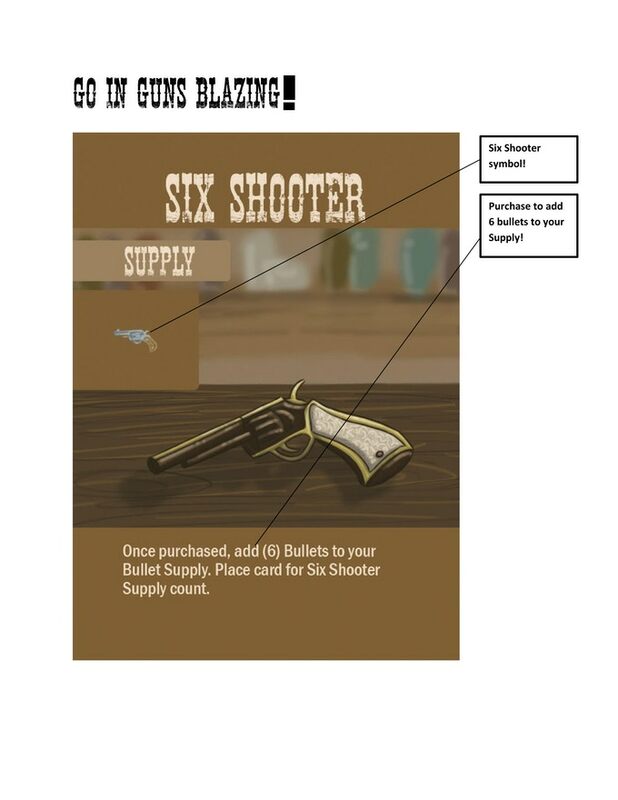 As you shoot critters and duel, you expend bullets and need to buy more, hence the need for money or trading. Some duels require eight bullets which means you need another holster, gun, and enough ammo. Better find some money or rob a bank! Failing quests also costs stamina, which is sustained by rations, and rations have to be bought or found. With 10 stamina to start and a maximum game allocation of 20 stamina, there are some whopping blows for the unprepared. We saw some surprises when a -8 stamina duel came out that needed at least two guns to kill as well as some dynamite that could take 6 stamina at a punch. Horses, which allow you to flee danger, are useful, but your starting six are a game limit as there is no way to acquire more. Because of this, you do need to manage your life as best you can with the hand you are being dealt by the game. In one game, player one got the first 4 of the outlaws which provide the big bounty (victory points) and notoriety, so he upgraded quickly. He had issues keeping bullets, stamina, and food because he could not find any money or rations, unlike player two who was rolling in dough but could not find anything to get bounty or notoriety. My final thoughts do not stray from my opening comments.This is a multi-player solitaire, card driven game with little control over your fate. Unlike Oregon Trail, there are decisions on selling and buying to prepare you for what is to come. Unlike Chainsaw Warrior, it is multi-player and has no dice rolling. It is soundly in the arena of a single person dungeon crawl set in a western environment. I think people looking for this style of game will have a fun time laughing at their fate in the wild west as our group did on several occasions. If this is not your style of game, steer away. I played this with a close friend and very much enjoyed it. While I do agree with points of the review (the six shooter loophole is interesting!) I liked the random aspect. It makes every turn fun and unpredictable! One thing I liked about this is the different difficulty levels! I found that playing on wild wild west mode makes the game more challenging. It gives you more decisions to make right off the bat instead of just exploring the deck. Another positive: I also like the bounty records. One day I’ll reach the top ten!